A drive along the beautiful coastal road of Attica will take you to its most southerly spot to yet another impressive historical site, Cape Sounion, with the Sanctuary dedicated to Poseidon, the God of the Sea. 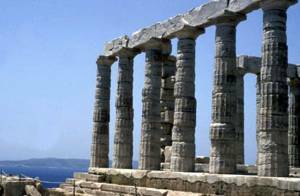 High on the cliff, majestically overlooking the Aegean Sea, stand several columns of the former Temple. One has a breathtaking view from here; on clear days, you can see several islands. After the guided visit, there will be plenty of time for memorable photos from the site. Rates are subject to change in case the archaeological sites and/or museums increase the entrance fees.